One of my favorite things about Pittsburgh has always been the passion of the fans. We defend our teams to the death, willing to put everything on the line if someone dares to insult them. It is what we grow up with here; what runs through our veins. We are born with it much like a birthmark that is never covered up. With this passion and adoration comes the negatives as well. We are so mentally and emotionally caught up with our teams that we sometimes forget that in the game of hockey, an 82 game season, losses occasionally occur. They happen. The Penguins are fantastic but they're human. You can only win so many games before giving up a few. It's normal. It's life. Demanding perfection out of any team is unrealistic and a good way to end up disappointed. I cannot even begin to explain what happens to fans on social media when the Penguins lose. It's pure panic. For example, the Saturday night loss to Montreal. The Penguins got beat in every aspect. They looked out of sync and the Canadiens exposed it. It's fine. Morning skate had been canceled because of road conditions and it showed. Remember this: The Penguins have players coming in and out of their lineup and at one point were missing 12 players to injures and sickness. That's a lot of changes. And frankly given their circumstances they have done an impressive job in finding ways to win even with a roster that resembled more of an AHL team than an NHL team. Panic should be saved for your team missing the playoffs or continuously making bad trades. It should not be used for a team that has ten regulation losses in January. That's ridiculous and why opposing fans think we are spoiled. We are. We have two of the best players in the world and a supporting cast that rivals any other team. I would hate us too. The team went through an overhaul this season replacing coaches, a GM and frankly throwing top notch players in the game into a brand new system under a brand new coach. And they have exceeded all expectations given. Be proud of that and stop second guessing every loss that happens. There will be more. Credit should be given to the coaches for running a system that works well for both the WBS and the Penguins as well as to the players for having the mentality to "win no matter what the circumstances are." You cannot change what happens but you can change how you react to it. The Penguins are well on their way to the playoffs and hey, even the best fall down sometimes. So true! I sometimes get tired of fans jumping on and off the bandwagon. 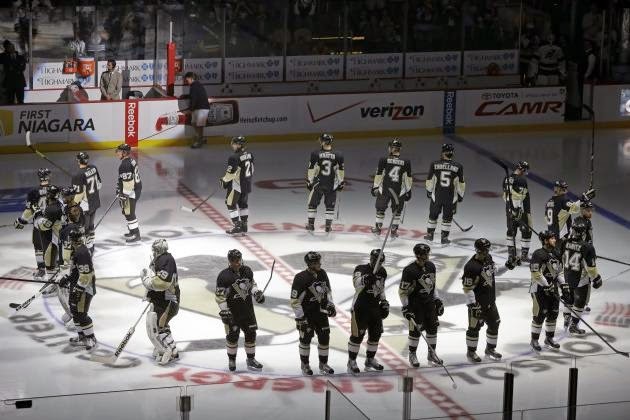 The Penguins are my team---win or lose!